I’m glad the weekend is here, but it’s gonna be a busy one for us with housework, errands, a long run for half marathon training, and a big gig for hubby’s band that involves a lot of driving and planning. I love all the activities, but will also enjoy a little downtime after a hectic week at work and trying to keep things running smoothly at home with 3 dogs and 2 cats. Things are still hectic in that area since Skipper moved in with us last month. Treating his canine diabetes has not been easy or cheap giving him insulin shots twice a day. Plus we’ve been having to get creative with that since he’s figured out when he gets the shots and that he does not like them putting up a fight. It’s been an interesting learning experience. House and yard work has also increased, I’m cleaning up a lot more messes inside, washing dog beds, food bowls, cleaning up a lot of poo in the backyard, etc. It’s been a challenge to get into an efficient routine, but it’s getting better and hopefully I’ll have more time in the kitchen for recipe creation soon! Skipper has finally started using his dog house in the backyard after we moved it under the overhang where he likes to sleep at night and hopefully that will work out well for him for the colder winter weather. My eats this week have not been too exciting, lots of smoothies and salad leftovers like this interesting lunch of leftovers I had with my mom yesterday. 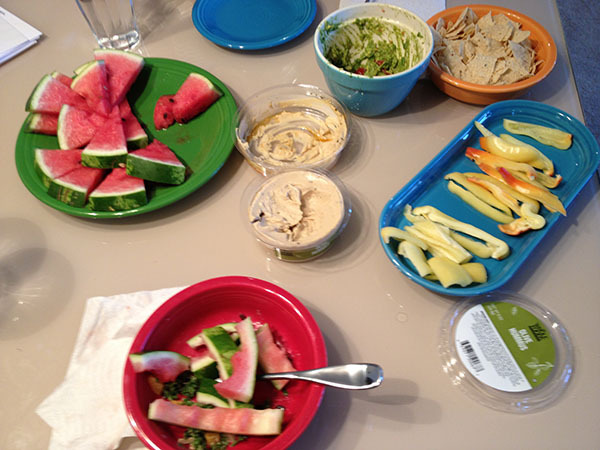 We were using up kale salad leftovers, hummus, guacamole, watermelon from the family gathering last weekend, etc. Dinner last night was excellent though. Since hubby is eating a lot less meat, we’ve been trying more vegan-friendly restaurants in the area and have been obsessed with Indian food lately. 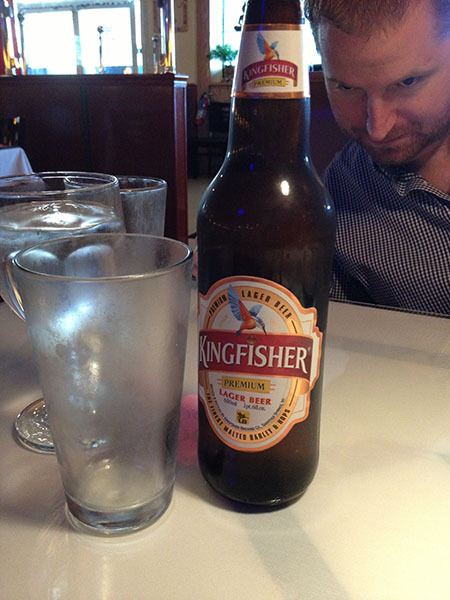 We decided to try a new place called Namaste Nepal and it was a great experience starting with Kingfisher Indian Beer. I’m not a huge beer person and can’t stand most of the mass-market beers, but this one reminded me of a good Japanese beer with a strong, non-bitter flavor. 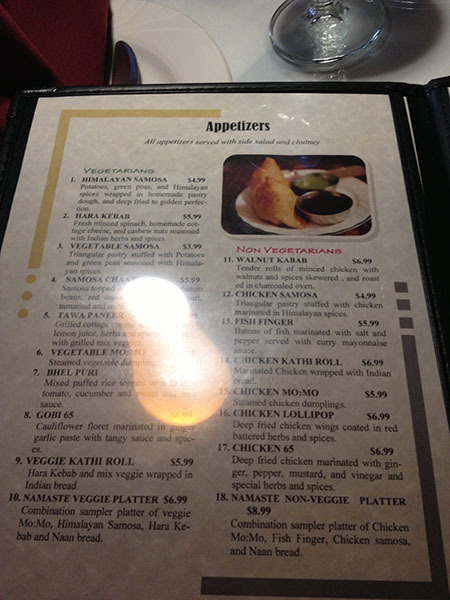 The menu had a lot of vegan and vegetarian options to choose from. 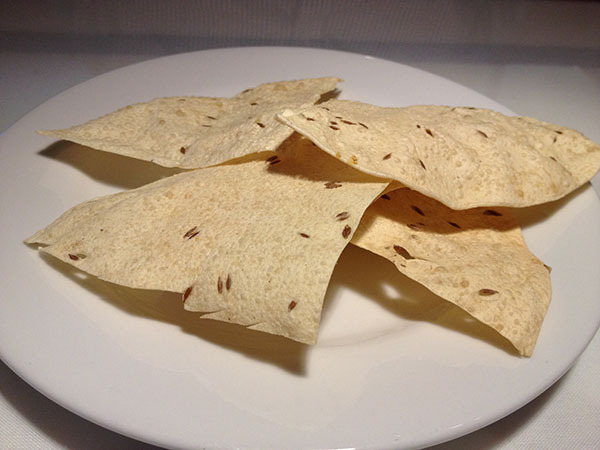 We started with the house appetizer of thin crispy crackers served with three dipping sauces. 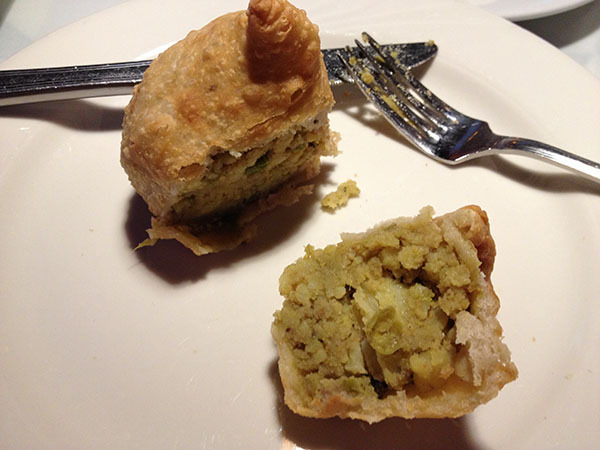 And vegetable samosas, which were huge. And stuffed with a delightful spiced potato veggie mixture. 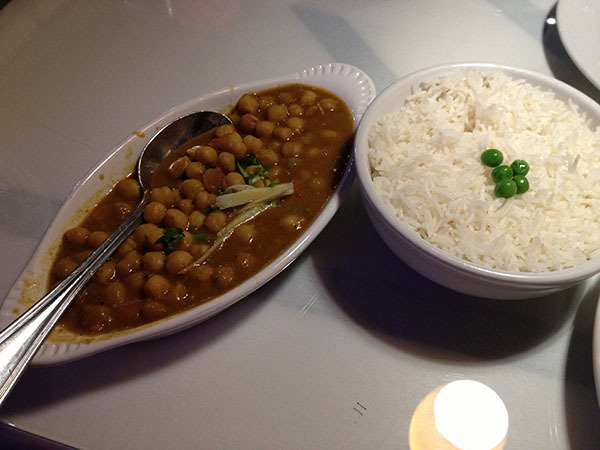 I went very traditional for my main course with the chana masala dish because I just love the spicy tomato sauce. And the medium level of spice on this dish did not disappoint! Hubby and I stuffed on a lot of vegan food and beer, but the total bill was less than a bottle of wine from other restaurants – can’t complain about that! I have a few new recipes to try over the next week, but gotta get through a full day today of errands, gym, cleaning, and a gig – whew! The menu looks amazing! LOVE all of the options! 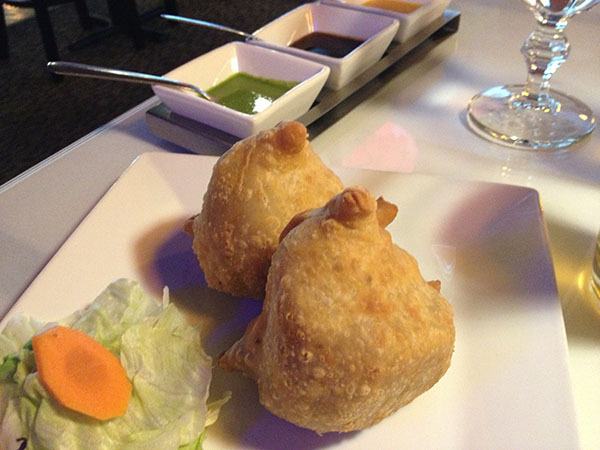 Those samosas look terrific, too, and I totally want some! It’s been way too long since I have had them and am craving them! The raw fruit and veggies sound great and of course you know I LOVE all the dips! YUM! He was laughing at that pic too because it makes him look angry, lol.